The Practice also works with an organisation called BB Healthcare Solutions whereby we provide Gp & Nurse appointments from 6.30-8.00pm in the evenings and during the day at weekends and on Bank Holidays. These can be pre-booked at the surgery subject to availability. The above arrangements may alter during times when a doctor is on holiday, on sick leave or attending educational courses. GP appointments are scheduled at ten minute intervals. 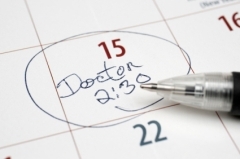 If you have more than one individual topic that you wish to discuss with the Doctor, please advise the receptionist when you book and they can make a "double" appointment for you. Unfortunately the GP may not be able to address more than one issue in this short space of time. We do also ask that all patients attend on time for their appointment. Whilst we appreciate that sometimes the Doctor may run late in their schedule this does not allow for patients to attend late. It simply means that a patient before you has clinically required more time for the Doctor to deal with their problem. We would be grateful if you could bear this in mind if you do experience a delay. Although Nurse appointments are slightly longer at fifteen minute intervals we do also ask that patients afford the nurses the same courtesy as detailed above. Appointments are bookable 2 weeks in advance or, when necessary, on the day. We also have appointments at other locations, known as "Hubs", in and around Billericay and Basildon. If you wish for an "on the day" appointment, please ring at 8.00 am for a morning slot or at 11.30 for an afternoon slot. On the day appointments are only available up and until the capacity allocated at the surgery has been filled. The Practice runs a surgery on Saturday mornings between the hours of 8.00am and 10.45am. This is a service for pre-booked appointments only and NOT for emergency patients. We also provide a full reception service on a Saturday which you can access using the usual telephone number of 01277 658117. Our Receptionists will be able to book appointments up to two weeks in advance for both Doctors and Nurses, they will be able to provide test results and advise in regard to registering with the Practice. However, they will not be taking telephone requests for prescriptions. The prescription telephone service will remain in operation for Monday – Friday only. This should be used in all cases where you require medical attention urgently and you will be directed to the out of hours service. This can be used for all routine enquiries; you can also enquire if there are appointments available on that Saturday but should appreciate that we will not be able to accommodate same day requests for appointments if none are available. In such cases where you need to be seen on the same day, on a Saturday, you will be asked to contact the out of hours service. You can also book online via the link at the top of this page. If you would like to register for this service please call into the surgery with photographic ID and ask one of the reception team to register you for this service. Within 1 hour of registration you will be able to book appointments and order prescriptions on line.